The Exchange Club of Rome hosted their annual One Nation Under God presentation at a recent meeting. 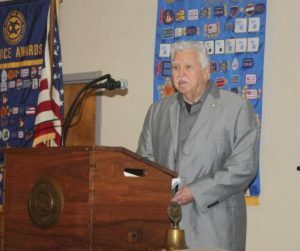 They were treated to a performance of their own Exchange Club Singers, featuring Bill Goff, Scottie Edwards, Wain Bates and Harry Wise, with Barbara Elliott accompanying. The One Nation Under God speaker was Exchangite Lt. Gen. Billy Brown (USA Retired). Enlisting in the Army with only an 8th grade education from Model School, he went on to earn his GED while in service. Having seen the need of further education, Brown became a lifelong learner. His education is extensive: Bachelor of Business Administration, Bachelor of Theology, Master of Theology, Doctor of Divinity and Doctor of Ministry. After having made a promise to God that if he could survive Korea, he would dedicate his life’s work to a God and Country agenda. Because of a shortage in the U. S. Corps of Chaplains several years ago, Brown volunteered and was commissioned for the Chaplain Service. He was promoted to the rank of Lt. General and is currently involved with veteran and military groups.